A mouth that looks and feels healthy? Clean teeth that look pearly white and are free of debris? Healthy pink gums that don't bleed or hurt when you brush or floss? A mouth that smells healthy and is completely free of bad breath? Freedom from cavities, gingivitis and other oral diseases? A healthy smile that fills up the social calendar, helps conduct business and increases romance in life? Yes, you read that right! Dental hygiene is the key to a healthy mouth and a happy you. It has both cosmetic and strict medical value. You not only improve the esthetics of your teeth, gums and smile, but also safeguard yourself from bad breath and a host of dental problems. But that's not all. Good dental hygiene is also the key to recovering fast from an array of oral pathologies such as dental trauma, cysts and periodontitis. And that's not even the best part! The best part about dental hygiene is how simple and easy it is to obtain and maintain! 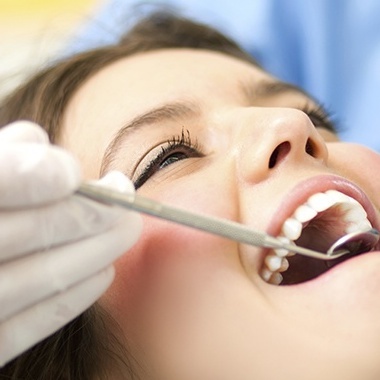 You can be your own dental hygienist and take charge of your dental hygiene, which is exactly what your well-wisher dentist here at Greencastle Dentistry would like you to do. We believe in empowering you to be orally healthy so that you save time and money. Brush your teeth thoroughly, at least twice a day and preferably after every meal. Use an electric toothbrush for better, easier cleaning. Choose fluoride-based toothpaste only and use only a pea-sized amount for brushing. Ensure your brush has soft bristles. Use the right technique when brushing. Hold your toothbrush at a 45-degree angle to the gums and use an up-and-down motion on each tooth separately. Focus on cleaning the chewing surface of each individual tooth, and the surface where teeth meet gums, to prevent cavities and gum diseases respectively. Floss daily and use a dental rinse/mouthwash for added protection. Replace toothbrush every three months, or sooner if bristles lose shape. Visit your dentist regularly for timely dental cleanings and check-ups. In addition, give your Greencastle Dentistry dental hygienist a prompt call the moment you notice anything unusual, such as tender/bleeding gums, sensitivity to cold or hot foods, poor taste or bad breath and changes in the alignment or shape of your teeth. Remember, the sooner you tell us about the problem, the sooner we can solve it for you. Schedule an appointment today!